Lent Day 18: Leave. Can I leave this crazy kid place yet? Lol. Too. Much. Noise. Yes, an irreverent take on the theme. Lent Day 18: Leave 2.0 - Let go, leave it to God. Today's theme has layers of meaning for me. Yes, I know I posted the first picture - because I felt the desperation many (not just adults lol), feel at places like Fastlanes. 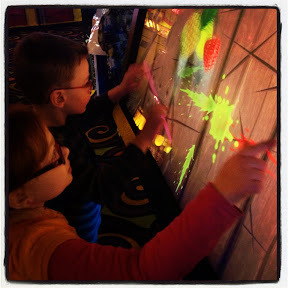 A crazy, loud, insane space filled with arcade games. The kids had a blast - Aunt Kaylea not so much. The second, is a bit more serious. It's an image that actually popped up on my Facebook feed tonight. I know it isn't a Biblical quote, but it seems so appropriate for Lent and for things taking place in my life. 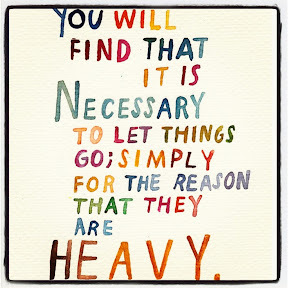 Sometimes, you simply have to let things go, because they are heavy - and just weigh you down. To be renewed, you must give up the old. You have to do some "spring cleaning" of sorts, to make room for the new things or opportunities God will put in your life. The cleaning isn't always easy. Actually, if you relate it to the "pruning" a gardener might do to a rose bush - it's pretty painful. But without pruning, the roses wouldn't bloom bigger and better. Ultimately, today's theme reminded me of a verse I struggled with in Seminary - probably because I often have a stubborn, hard heart. God wants all of us - me included - to give up the heavy stuff that makes our heart hard, so we can be receptive not only to his love, but to the people around us. I guess my prayer today is that God will continue to soften my heart - so I ultimately have the tender, responsive heart he desires. ...open to the calling God has placed on my life. ...open to the needs of others. ...open to God's amazing love and compassion. ...open to just existing in God's grace and mercy, accepting the gifts unconditionally.